"This is a very moist cake. Very easy to make. 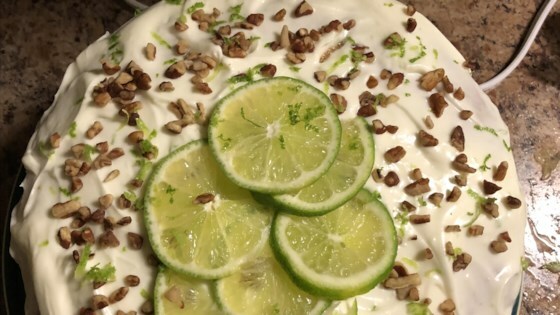 If you like key lime, you will love this cake." Combine cake mix, gelatin mix, oil, eggs and orange juice. Pour into three 8 inch cake pans. Bake according to instructions on box. Allow to cool, then frost. To make the frosting: In a large bowl, beat the butter and cream cheese until light and fluffy. Add lime juice and confectioners sugar. Mix well. I did cut way back on the oil to 1/2 cup & added 1/2 cup applesauce. Very moist.